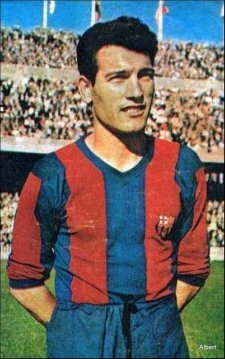 Joan Segarra Iracheta (Barcelona, 15 November 1927 – Taradell (Osona), 3 September 2008) was a Catalan footballer, captain of the "Barça of the Five Trophies", one of the best teams that FC Barcelona have had in their history. He played in the first team as a cb for 16 seasons for the club, between 1950 and 1964, in which he played 299 matches in La Liga. Known as “the great captain”, Segarra (Barcelona, 1927 - Taradell, 2008) was one of the moast charismatic players in the history of FC Barcelona. The legendary defender was part of the Barça of the Five Cups in the 1950s and is the player who has made the fifth most appearances in the Barça colours, behind only Migueli, Rexach, Amor and Rifé. He was unable to show the continent what he could do at the disappointing European Cup Final in Berne, 1961, because of an unfortunate eye injury.